Managed print services (MPS) are used to gain visibility and control of the printing infrastructure, which helps the organizations to save money and boost productivity. Managed print also helps to improve environmental sustainability and document security. Managed print services (MPS) usually begins with a requirements gathering process. The next step includes a partial or complete replacement of existing hardware, including scanners, printers, faxes, photocopiers, and multifunction (MFP) devices. The service provider oversees as well as services hardware and provides parts and supplies. An MPS provider may also monitor and report on usage, problems, and user experience. 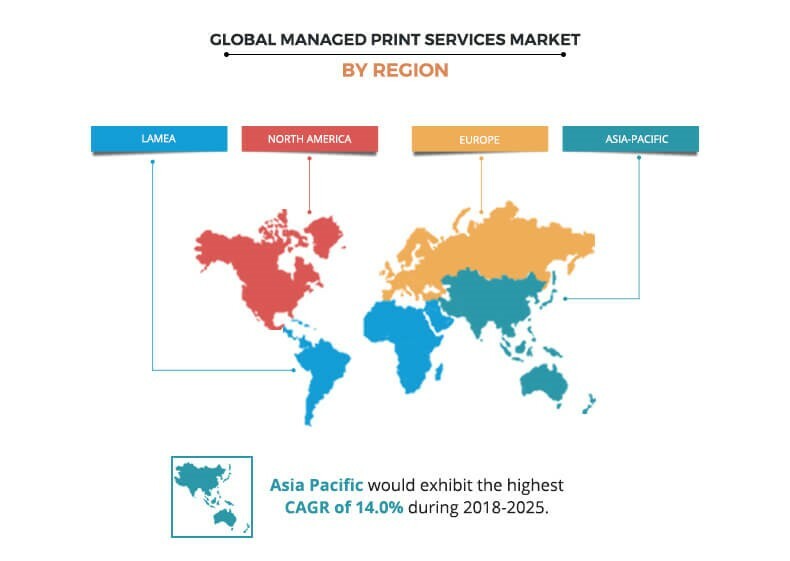 The global managed print services market size was valued at $27,500 million in 2017, and is projected to reach $59,709 million by 2025, growing at a CAGR of 10.3% from 2018 to 2025. The device management segment dominated the overall managed print services (MPS) market share in 2017 and is expected to continue this trend during the forecast period, due to increase in adoption of these solutions to optimize the performance of network printing devices and to maximize efficiency and take control of costs. 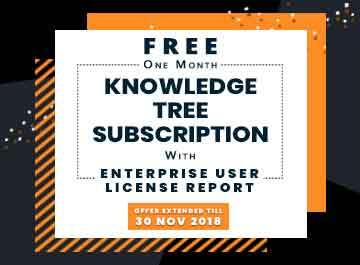 Also, it allows network users to share devices more effectively when printing and also help system administrators to achieve enhanced device management efficiency with the benefit of integrated, centralized control. However, document imaging is expected to witness the highest growth rate during the forecast period owing to rise in demand for image capture for big data handing and analytics in many organizations. The BFSI industry dominated the managed print services market share in 2017 and is expected to continue this trend during the forecast period, due to the wide use of papers for loan applications, new account opening and other purposes, which leads to high investment cost in resources. 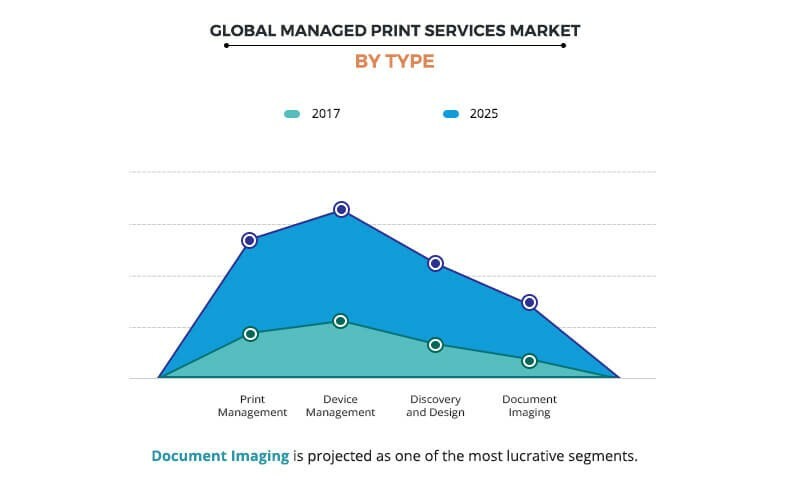 However, the healthcare industry is expected to witness highest CAGR in the managed print services market forecast period due to growth in adoption of managed print services in the healthcare industry to manage and optimize a high-volume print environment while reducing vulnerabilities with thousands of devices, which fuels the growth of the managed print services market. North America dominated the overall managed print services market in 2017, due to the presence of leading printer/copier manufacturers, favorable government regulations, and rise in number of startups in this region. Also, the healthcare and government industries in the U.S. have aggressively adopted the managed print services, which fuels the growth of the managed print services market. However, the Asia-Pacific region is expected to grow at the highest CAGR due to continuous rise in the retail & consumer goods startups across the countries such as India, China, and Japan. The report focuses on the growth prospects, restraints, and trends of the MPS market. The study provides Porter’s five forces analysis of the managed print services industry to understand the impact of various factors, such as bargaining power of suppliers, competitive intensity of competitors, threat of new entrants, threat of substitutes, and bargaining power of buyers on the managed print services market growth. The global managed print services market is segmented based on type, deployment mode, organization size, industry verticals, and regions. In terms of type, the MPS market is categorized into print management, device management, discovery and design, and document imaging. Based on deployment mode, it is bifurcated into hybrid cloud and on premise. Based on organization size, it is classified into large enterprises, medium enterprises, and small enterprises. 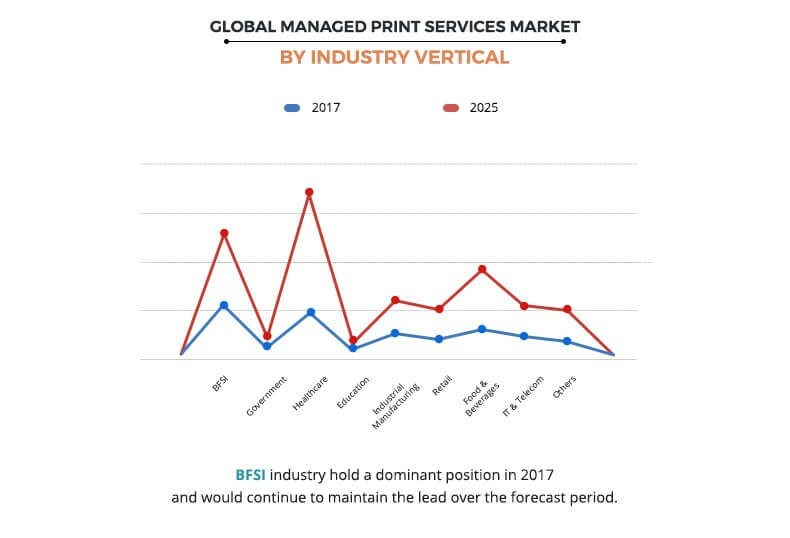 In terms of industry vertical, the managed print services market is classified into BFSI, government, healthcare, education, industrial manufacturing, retail, food & beverages, IT & telecom, and others. Based on region, it is analyzed across North America, Europe, Asia-Pacific, and LAMEA. The key players operating in the global managed print services market include Xerox, HP Inc., Ricoh Company, Ltd., Lexmark International, Inc., Konica Minolta, Inc., Canon Inc., Kyocera Document Solutions, Sharp Electronics, Toshiba, and ARC Document Solutions. Rise in adoption of big data solutions, initiatives to decrease paper wastage in the workplace, reduced cost of operation, surge in productivity and flexibility to match custom requirements, and improved information security, majorly supplement the growth of the MPS market. However, new and strategic partnerships & agreements and recurring cost is expected to hamper the managed print services market growth. Furthermore, increase in print security spending and rise in adoption of cloud MPS are expected to provide lucrative opportunities for the global MPS market. Companies that are utilizing big data solutions are increasingly adopting managed print services to streamline its operations, reduce costs, and increase productivity within the workplace. MPS provide users the ability to create digital files by scanning documents to the computer, thus, allowing businesses to better control, manage, and refer to their most important documents. Document management software allow the various departments within the organization to collaborate better for analytical purposes. By utilizing optical character recognition (OCR), managed print services allow businesses to sort and organize important documents more efficiently. Also, MPS offers enhanced security features that are expected to help protect the valuable information from network breaches. Due to numerous benefits offered by managed print services, its adoption among the organization that wants to utilize big data solutions is continuously increasing, which drives the growth of the managed print services market. Organizations are increasingly implementing one or more green initiatives for the purpose of customer-facing benefit and cost savings benefits that green initiatives can bring. As a part of these initiatives, many organizations have begun to for ways to reduce paper usage in the workplace as a simple, straightforward and effective path toward more far-reaching sustainability goals. For instance, according to a study, a company generates an average 7.8 metric tons of waste. Almost 40% of that waste is easy-to-recycle paper. The study also found that if companies can reduce their paper waste by just 1%, they will save almost $1 billion, due to which many organizations are finding ways to reduce paper wastage. Managed print services enable organizations to make incredible progress toward efficiency on a permanent basis. Instead of providing one or two short-term ways to conserve paper, it allows organizations of any size to eliminate print servers and streamline print management and cut down on consumables usage for good. Internet of things type security vulnerabilities on printers are expected to become a more common attack vector as cyber-attacks that exploit IoT devices are continuously on the rise. Protecting print environment is challenging due to its complexity, particularly with mixed fleets compromising outdated old and new devices. GDPR has driven some improvements in print security, however, there is still some lack of awareness of the potential IoT security risks around printers and smart MFPs. As number of managed print services providers maintain, and manage print devices through the cloud, security is estimated to become an important factor for the organizations, which will increase spending on the print security to create opportunities for the market. Furthermore, print manufacturers are expanding their security assessment and monitoring services, along with partnership with traditional IT security vendors, particularly in the area of threat intelligence is increasing the attractiveness of the managed print services market. 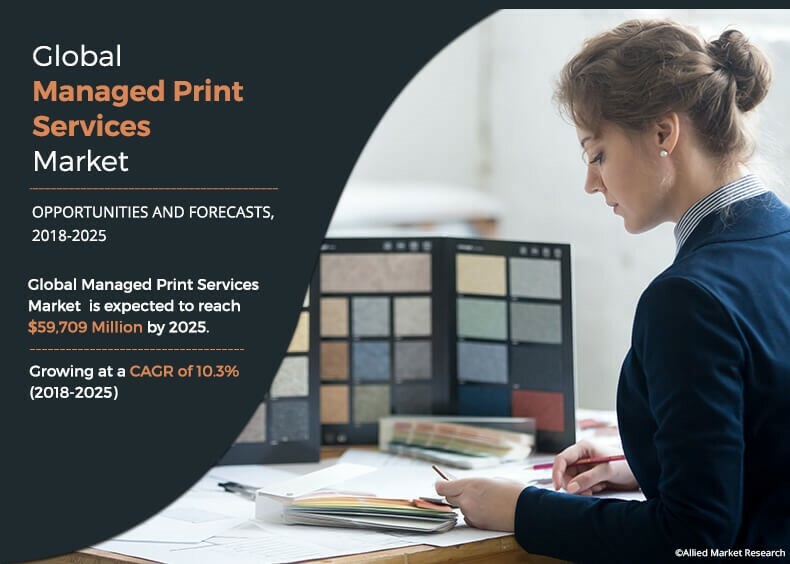 This study includes the global managed print services market analysis, managed print services market trends and future estimations to determine the imminent investment pockets. The report presents information related to key drivers, restraints, and managed print services market opportunity. The managed print services market size is quantitatively analyzed from 2017 to 2025 to highlight the financial competency of the industry. Porter’s five forces analysis illustrates the potency of buyers & suppliers in the global managed print services industry. 9.4. KYOCERA DOCUMENT SOLUTIONS INC.
MPS adoption in the small and medium businesses (SMB) market remains relatively low, as compared to the enterprise market. While leading channel organizations have invested in the resources, expertise and infrastructure required to offer and deliver MPS, others are yet to make the leap. The demand for managed print services (MPS) has increased largely over the period as it use of MPS helps in reducing dependency on paper that encourages organizations to print only the necessary documents. Moreover, rise in environmental concerns, especially with regard to paper and unnecessary energy consumption are expected to increase the demand for managed print services. The benefits of using managed print services have helped organizations to efficiently meet their demand while further reducing paper wastage. In addition, government sectors and law firms extensively use paper as compared to other industries. Thus, if government sectors and law firms employ managed print services, it will help them in achieving higher Return on investment (ROI). The global managed print services market is consolidated due to presence of several international as well as regional vendors. There is intense competition among managed print services companies in terms of pricing, user-friendly interface, value-added benefits, and service portfolio. The focus of the players to enhance their product portfolio is expected to further intensify the level of competition among the players in the managed print services market. Some of the major key players profiled in the report include Xerox, HP Inc., Ricoh Company, Ltd., Lexmark International, Inc., Konica Minolta, Inc., Canon Inc., Kyocera Document Solutions, Sharp Electronics, Toshiba, and ARC Document Solutions. These players have adopted various strategies to enhance their product & service offerings and increase their market penetration. For instance, in February 2019, ARC launched ARC Print that allows users to order prints, share files, and track orders at nearly 200 services centers around the world. This app features send files for print, receive real-time job updates, schedule a pick-up, and set delivery options. In October 2018, HP launched new print services and solutions to help businesses gain more flexibility and scale. This includes HP FutureSmart firmware for HP Enterprise-class printers and MFPs, Immersive analytics service and integration with both McAfee security information and event management (SIEM) and Microsoft system center configuration manager (SCCM).